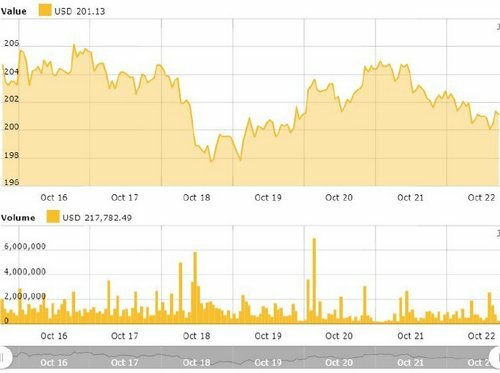 Monday, Oct. 22: markets have taken a slight downtrend after trading sideways last week, with 15 of the top 20 digital currencies by market capitalization in the red, and Bitcoin (BTC) trading around $6,400, according to data from CoinMarketCap. The BTC price has been trading in a narrow corridor from $6,372 to $6,730 at its highest point during the day. The leading cryptocurrency has lost 0.45 percent over the last 24 hours, and is trading at $6,483 as of press time. In terms of its weekly performance, BTC has seen a price drop by 0.43 percent, per Bitcoin Price Index. Ethereum (ETH) has seen larger losses on the day, with a 6 percent drop and trading around $201 at press time. 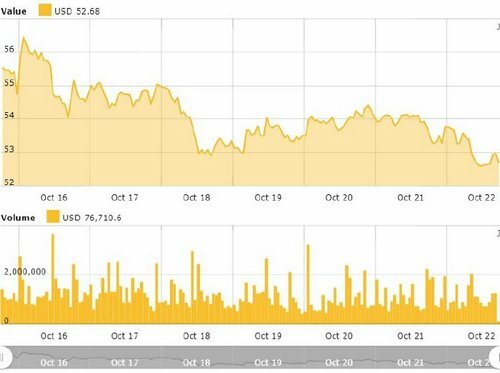 Its weekly chart shows that ETH fell to as low as $202 on Oct. 19, while its highest point was $212 on Oct.16, subsequently correcting downwards and then sideways in the last few days. The second largest coin is down over 1.5 percent during the last 7 days, with monthly losses over 16 percent. Litecoin (LTC) has gained 1 percent on the day and is trading around $53 at press time. On its weekly chart, LTC has declined from its peak of $55 on Oct. 16 echoing a similar value from Oct. 19. Tether (USDT) has seen a slight gain of around 0.33 percent, and is trading at $0.986 at press time. Today marks the higher price point of the coin over the last seven days, while its lowest point was $0.96 on Oct.18. The remaining top ten coins on CoinMarketCap are down slightly or trading sideways, with Ripple (XRP) losing 1.07 percent to trade at $0.453, EOS down 0.86 percent at $5.38. Stellar (XLM) is up by a slight 0.27 percent to trade at $0.242. Bitcoin Cash (BCH) is also down by 0.39 percent, Cardano (ADA) is down by 0.07 percent, and Monero (XMR) is up by 0.06 percent. Total market capitalization of all digital currencies is over $209 billion at press time, up around $3 billion from its intraweek low of around $206 billion on Oct. 19. 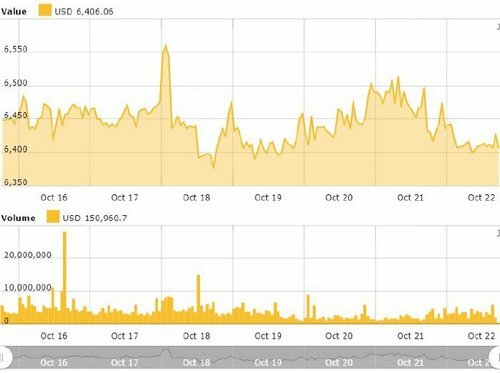 Digital currencies have mostly been trading sideways over the last week, though yesterday Oct. 21 the market saw a little momentum, with all the major cryptocurrencies making slight gains, and BTC trading back above $6,500. Total market cap saw a slight influx over the day, up to $210 billion from $209 billion.